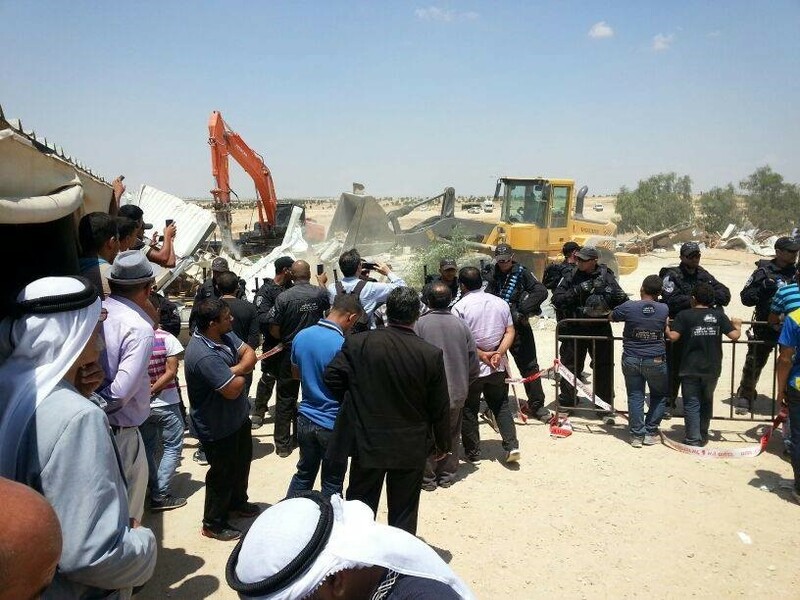 Police forces and Israel Land Authority workers demolished structures in the unrecognized Arab-Bedouin village of Al-Arakib in the northern Negev, on Thursday morning. This is the 65th time the village has been razed in the last decade and a half. According to Al Ittihad daily newspaper, 9 people were arrested during the demolition of Al-Arakib. Among them: Rabi Arik Asherman and the Hadash activist, Yuval Halperin. The demolition of some 20 structures erected in the village’s cemetery began shortly after the Ramle Magistrate’s Court rejected an appeal by residents against their expulsion from the village. Many residents of the village, which has been evacuated numerous times in the past, took refuge in the local mosque, itself built inside the cemetery. The State Prosecutor’s Office denied that the structures were in the cemetery proper, saying they were just outside it. Al-Arakib residents have been waging a lengthy legal battle ever since the village was first demolished in 2010. Notices were posted May 21 informing the villagers of the state’s intention to demolish the structures and giving them 21 days to evacuate. Those 21 days expired on Thursday morning. The villagers maintain that they own the bank on which the village is built and were forcible evicted from their land by the Israel Defense Forces in 1950.